Older adults are one of the groups that are more susceptible to getting the flu, so as a provider ofsenior care services you should protect yourself from the illness as well. You don't want to be a carrier only to realize that you made one of your clients ill when you passed the flu on to them. According to the U.S. Centers for Disease Control and Prevention, 90 percent of those who die from influenza are age 65 and older. Flu season in the U.S. starts as early as October and can last through late May, and a vaccination is the best way to protect yourself against the flu. Each year, several flu vaccination options are available for the general population and help to protect against the most common viruses for the upcoming season. 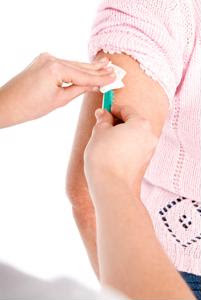 The CDC said that traditional flu vaccines protect against influenza A strains H1N1 and H3N2 and influenza B. There are also vaccines that can protect against four strains of the flu virus and include the same viruses as the traditional vaccine as well as an additional B virus. Anyone who is age 6 months and older as well as age 65 and older is recommended to get inoculated against the flu, and the more people who are vaccinated the less likely it is to spread throughout the community.